One of the statues found at the villa. A very exciting discovery was announced yesterday by Italian archaeologists, during excavations at the villa of Marcus Valerius Messalla Corvinus, in Rome’s suburb of Ciampino: They have unearthed an “exceptional” group of sculptures from the 1st century BC. 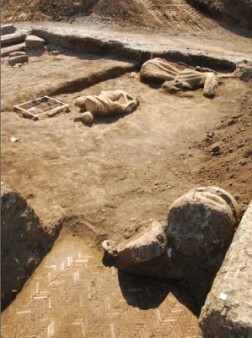 The statues as found in situ. The Roman general Marcus Valerius Messalla Corvinus was the patron of Ovid, and the sculptures tell the myth of Niobe, the proud daughter of Tantalus who lost all her 14 children, because she boasted about her fertility to Leto (mother of Apollo and Artemis). According to the myth, Niobe was turned to stone. The excavations at the villa brought to light a thermal bath area with mosaic fragments and a swimming pool of 20 m length with walls painted blue. 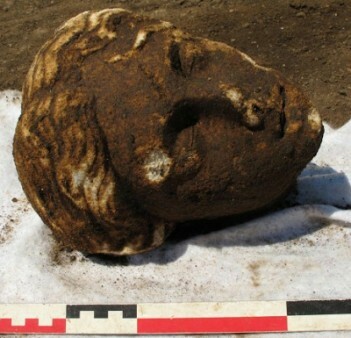 Within the bath area, archaeologists have unearthed seven Augustan era sculptures and a series of fragments which experts say can be reassembled. The group of sculptures tells the story of Niobe, which is contained in Ovid’s epic poem of transformation, the Metamorphoses, published in 8 AD. 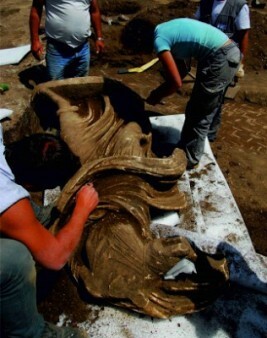 As written in La Repubblica on Tuesday, the discovery by Italian archaeologists was made last summer. 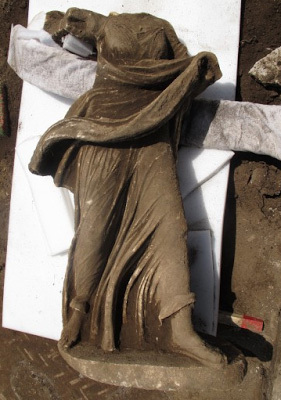 “Statues of Niobe have been found in the past, but in the case of Ciampino, we have a good part of the group,” of statues, said Elena Calandra, superintendent of archaeological heritage. According to their reconstruction of the bath area, experts say the statues were carved on all four sides of the swimming pool, which may have been buried by an earthquake in the 2nd century AD.